On March 16, 2012, Dharun Ravi, the former Rutgers University student accused of spying on his roommate Tyler Clementi, was found guilty of privacy invasion, tampering with evidence, and bias intimidation. News headlines around the world were quick to praise the jury verdict, celebrating the decision as a symbol for an end to cyberbullying. For some, the conviction may instinctively feel right. While Ravi was not officially charged with causing Clementi’s death, his suicide was ubiquitously present in the courtroom, seeping into each criminal count. Upon deeper reflection, however, this conviction is more troubling than it is justice-serving. While the evidence clearly convinced a jury of Ravi’s guilt with respect to the particular charges in this case, we cannot ignore the sensationalized news media focus over the last two years and the possibility that the public was ready for a scapegoat. Litigation against individual perpetrators of harm will not prove to be the panacea for a complex and multifaceted issue such as cyberbullying. Indeed, our research in the last decade confirms reactive interventions and zero-tolerance punishment are highly ineffective. In the aftermath of the Rutgers trial, society is once again confronted with the question of why so many youth and young adults like Ravi, no matter what their race or ethnic background, fail to appreciate the potentially devastating consequences of their online behavior. Ravi is not exceptional in setting up a webcam to play a cruel and demeaning prank on one of his peers. This type of behavior is widespread among youth and receives regular coverage in the news. 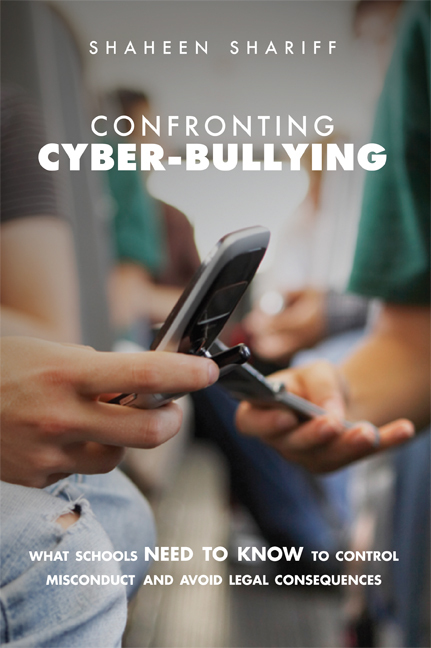 Cyberbullying has topped public policy and research agendas globally. Youth who have grown up immersed in digital media (“digital natives”) have difficulty defining the lines at which pranks, practical jokes and insults to entertain friends through the humiliation of others, cross over to the criminal realm with potential for serious harm. Not only are digital natives unable to recognize the impact of their cruelty, most adults in their lives struggle with helping them decipher the boundaries. In fact, there are more adult role models in society that reinforce such cruelty as acceptable norms in the public sphere, than there are role models that guide youth towards ethical and considerate choices. We send youth mixed messages all the time. For example, we live in a society where gay men are thrown out of political rallies for kissing in public and black children are shot for looking “suspicious” in hooded sweatshirts. Racial profiling is rampant at airports and North American jails are filled with racial minorities. Can we really blame our kids for lacking sensitivity chips when it comes down to tweeting a homophobic rant or posting a racist photograph? We cannot forget that perpetrators of cyber-harm are often victims themselves of bullying and other forms of peer pressure. For instance, targets of bullying are often, like Ravi, of ethnic descent and excluded for no reason above and beyond their perceived differences. The answer to confronting cyberbullying does not lie in suing individual students like Ravi or labeling them “bullies.” Most young people who engage in the type of pranks he committed are acting in a social, political and historical context that needs to be considered. Regrettably, the verdict in Ravi’s case addresses only the symptoms. It overlooks the reality that bullying in contemporary society is deeply rooted in homophobia, racism, sexism and other forms of discrimination which are tacitly condoned and supported by many apparently law abiding North American citizens. After Clementi’s suicide, lawmakers were quickly called to action. For instance, in what has been hailed as the strongest anti-bullying legislation in the U.S., New Jersey lawmakers enacted the Anti-Bullying Bill of Rights. Under the new law, schools in New Jersey are required to report, investigate, and resolve bullying issues within a 10-day deadline. Indeed, kids found bullying in the lunch line in East Hanover schools can be reported to the police by their classmates through anonymous tips to the Crime-stoppers hot line. While perhaps New Jersey lawmakers’ hearts were in the right place and, without question, the desire to “do something” is always a compelling motivation to draft a new bill, this law and similar laws in Canada, arguably miss the mark. Solutions to bullying which focus on punishment, and not for instance, holistic and comprehensive education, put a band-aid on the underlying problem. As I have strongly advocated in my first edition of Confronting Cyberbullying, zero-tolerance approaches exacerbate the problem. Furthermore, initiatives that focus solely on reprimanding perpetrators without acknowledging or investigating the experiences of other victims of bullying, also fail. If laws don’t work what will? Collaborative initiatives that engage youth with a range of stakeholders such as parents, educators, corporate intermediaries and law-makers show greater promise of success. It is time we give youth ownership and accountability that helps them take responsibility for their actions in thoughtful ways, with adult support. In this endeavor, adults can work with children and teens to develop online interactive resources that help youth think about the impact of the forms of expression they post online. Just as we teach children to look both ways when crossing the street, adults need to work with children and youth to facilitate their understanding of why demeaning forms of online expressions can be so hurtful, especially where they involve public and private spaces and the lines at which jokes cross over to serious harm and legal liability. Given emerging anti-bullying legislation, there is also an urgent need to enhance legal literacy in children and adults. In the coming days, as we await Ravi’s sentencing, we owe it to Clementi not only to consider whether it is fair to make Ravi’s young shoulders carry the blame for societies’ failings, and ask how we can prevent similar situations from occurring again in future.